Economies of scale apply to a variety of organizational and business situations and at various levels, such as a business or manufacturing unit, plant or an entire enterprise. When average costs start falling as output increases, then economies of scale are occurring. If a firm's marginal cost of producing a good or service is beneath its average cost of producing that good or service, then the firm is experiencing economies of scale. Some economies of scale, such as capital cost of manufacturing facilities and friction loss of transportation and industrial equipment, have a physical or engineering basis. The simple meaning of economies of scale is doing things more efficiently with increasing size or speed of operation. Economies of scale often rely on fixed costs, which are constant and don't vary with output, and variable costs, which can be affected with the amount of output. In wholesale and retail distribution, increasing the speed of operations, such as order fulfillment, lowers the cost of both fixed and working capital. Other common sources of economies of scale are purchasing (bulk buying of materials through long-term contracts), managerial (increasing the specialization of managers), financial (obtaining lower-interest charges when borrowing from banks and having access to a greater range of financial instruments), marketing (spreading the cost of advertising over a greater range of output in media markets), and technological (taking advantage of returns to scale in the production function). 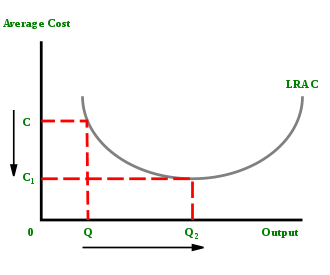 Each of these factors reduces the long run average costs (LRAC) of production by shifting the short-run average total cost (SRATC) curve down and to the right. Economies of scale is a practical concept that may explain real-world phenomena such as patterns of international trade or the number of firms in a market. The exploitation of economies of scale helps explain why companies grow large in some industries. It is also a justification for free trade policies, since some economies of scale may require a larger market than is possible within a particular country—for example, it would not be efficient for Liechtenstein to have its own carmaker if they only sold to their local market. A lone carmaker may be profitable, but even more so if they exported cars to global markets in addition to selling to the local market. Economies of scale also play a role in a "natural monopoly". There is a distinction between two types of economies of scale: internal and external. An industry that exhibits an internal economy of scale is one where the costs of production fall when the number of firms in the industry drops, but the remaining firms increase their production to match previous levels. Conversely, an industry exhibits an external economy of scale when costs drop due to the introduction of more firms, thus allowing for more efficient use of specialized services and machinery. The management thinker and translator of the Toyota Production System for service, Professor John Seddon, argues that attempting to create economies by increasing scale is powered by myth in the service sector. Instead, he believes that economies will come from improving the flow of a service, from the first receipt of a customer’s demand to the eventual satisfaction of that demand. In trying to manage and reduce unit costs, firms often raise total costs by creating failure demand. Seddon claims that arguments for an economy of scale are a mix of (a) the plausibly obvious and (b) a little hard data, brought together to produce two broad assertions, for which there is little hard factual evidence. Some of the economies of scale recognized in engineering have a physical basis, such as the square-cube law, by which the surface of a vessel increases by the square of the dimensions while the volume increases by the cube. This law has a direct effect on the capital cost of such things as buildings, factories, pipelines, ships and airplanes. In structural engineering, the strength of beams increases with the cube of the thickness. Drag loss of vehicles like aircraft or ships generally increases less than proportional with increasing cargo volume, although the physical details can be quite complicated. Therefore, making them larger usually results in less fuel consumption per ton of cargo at a given speed. Heat losses from industrial processes vary per unit of volume for pipes, tanks and other vessels in a relationship somewhat similar to the square-cube law. Overall costs of capital projects are known to be subject to economies of scale. A crude estimate is that if the capital cost for a given sized piece of equipment is known, changing the size will change the capital cost by the 0.6 power of the capacity ratio (the point six power rule). In estimating capital cost, it typically requires an insignificant amount of labor, and possibly not much more in materials, to install a larger capacity electrical wire or pipe having significantly greater capacity. The cost of a unit of capacity of many types of equipment, such as electric motors, centrifugal pumps, diesel and gasoline engines, decreases as size increases. Also, the efficiency increases with size. Operating crew size for ships, airplanes, trains, etc., does not increase in direct proportion to capacity. (Operating crew consists of pilots, co-pilots, navigators, etc. and does not include passenger service personnel.) Many aircraft models were significantly lengthened or "stretched" to increase payload. Many manufacturing facilities, especially those making bulk materials like chemicals, refined petroleum products, cement and paper, have labor requirements that are not greatly influenced by changes in plant capacity. This is because labor requirements of automated processes tend to be based on the complexity of the operation rather than production rate, and many manufacturing facilities have nearly the same basic number of processing steps and pieces of equipment, regardless of production capacity. Karl Marx noted that large scale manufacturing allowed economical use of products that would otherwise be waste. Marx cited the chemical industry as an example, which today along with petrochemicals, remains highly dependent on turning various residual reactant streams into salable products. In the pulp and paper industry it is economical to burn bark and fine wood particles to produce process steam and to recover the spent pulping chemicals for conversion back to a usable form. Economies of scale is related to and can easily be confused with the theoretical economic notion of returns to scale. Where economies of scale refer to a firm's costs, returns to scale describe the relationship between inputs and outputs in a long-run (all inputs variable) production function. A production function has constant returns to scale if increasing all inputs by some proportion results in output increasing by that same proportion. Returns are decreasing if, say, doubling inputs results in less than double the output, and increasing if more than double the output. If a mathematical function is used to represent the production function, and if that production function is homogeneous, returns to scale are represented by the degree of homogeneity of the function. Homogeneous production functions with constant returns to scale are first degree homogeneous, increasing returns to scale are represented by degrees of homogeneity greater than one, and decreasing returns to scale by degrees of homogeneity less than one. If the firm is a perfect competitor in all input markets, and thus the per-unit prices of all its inputs are unaffected by how much of the inputs the firm purchases, then it can be shown that at a particular level of output, the firm has economies of scale if and only if it has increasing returns to scale, has diseconomies of scale if and only if it has decreasing returns to scale, and has neither economies nor diseconomies of scale if it has constant returns to scale. In this case, with perfect competition in the output market the long-run equilibrium will involve all firms operating at the minimum point of their long-run average cost curves (i.e., at the borderline between economies and diseconomies of scale). If, however, the firm is not a perfect competitor in the input markets, then the above conclusions are modified. For example, if there are increasing returns to scale in some range of output levels, but the firm is so big in one or more input markets that increasing its purchases of an input drives up the input's per-unit cost, then the firm could have diseconomies of scale in that range of output levels. Conversely, if the firm is able to get bulk discounts of an input, then it could have economies of scale in some range of output levels even if it has decreasing returns in production in that output range. The literature assumed that due to the competitive nature of reverse auctions, and in order to compensate for lower prices and lower margins, suppliers seek higher volumes to maintain or increase the total revenue. Buyers, in turn, benefit from the lower transaction costs and economies of scale that result from larger volumes. In part as a result, numerous studies have indicated that the procurement volume must be sufficiently high to provide sufficient profits to attract enough suppliers, and provide buyers with enough savings to cover their additional costs. However, surprisingly enough, Shalev and Asbjornse found, in their research based on 139 reverse auctions conducted in the public sector by public sector buyers, that the higher auction volume, or economies of scale, did not lead to better success of the auction. They found that auction volume did not correlate with competition, nor with the number of bidders, suggesting that auction volume does not promote additional competition. They noted, however, that their data included a wide range of products, and the degree of competition in each market varied significantly, and offer that further research on this issue should be conducted to determine whether these findings remain the same when purchasing the same product for both small and high volumes. Keeping competitive factors constant, increasing auction volume may further increase competition. As for large landed property, its defenders have always sophistically identified the economic advantages offered by large-scale agriculture with large-scale landed property, as if it were not precisely as a result of the abolition of property that this advantage, for one thing, received its greatest possible extension, and, for another, only then would be of social benefit. Association, applied to land, shares the economic advantage of large-scale landed property, and first brings to realization the original tendency inherent in land-division, namely, equality. In the same way association re-establishes, now on a rational basis, no longer mediated by serfdom, overlordship and the silly mysticism of property, the intimate ties of man with the earth, for the earth ceases to be an object of huckstering, and through free labor and free enjoyment becomes once more a true personal property of man. ^ O'Sullivan, Arthur; Sheffrin, Steven M. (2003). Economics: Principles in Action. Upper Saddle River, NJ: Pearson Prentice Hall. p. 157. ISBN 978-0-13-063085-8. ^ Manufacture of specialty grades by small scale producers is a common practice in steel, paper and many commodity industries today. See various industry trade publications. ^ "Why do we believe in economy of scale? : Professor John Seddon, managing director Vanguard" (PDF). S3.amazonaws.com. July 2010. Retrieved 23 December 2017. ^ See various estimating guides, such as Means. Also see various engineering economics texts related to plant design and construction, etc. ^ The relationship is rather complex. See engineering texts on heat transfer. ^ [[In microeconomics, economies of scale are the cost advantages that enterprises obtain due to size, output, or scale of operation, with cost per unit of output generally decreasing with increasing scale as fixed costs are spread out over more units of output. Often operational efficiency is also greater with increasing scale, leading to lower variable cost as well. Economies of scale apply to a variety of organizational and business situations and at various levels, such as a business or manufacturing unit, plant or an entire enterprise. For example, a large manufacturing facility would be expected to have a lower cost per unit of output than a smaller facility, all other factors being equal, while a company with many facilities should have a cost advantage over a competitor with fewer. Some economies|Moore, Fredrick T.]] (May 1959). "Economies of Scale: Some Statistical Evidence" (PDF). Quarterly Journal of Economics. 73 (2): 232–245. doi:10.2307/1883722. JSTOR 1883722. ^ In practice, capital cost estimates are prepared from specifications, budget grade vendor pricing for equipment, general arrangement drawings and materials take-offs from the drawings. This information is then used in cost formulas to arrive at a final detailed estimate. ^ See various estimating guides that publish tables of tasks commonly encountered in building trades with estimates of labor hours and costs per hour for the trade, often with regional pricing. ^ See various engineering handbooks and manufacturers data. ^ Gelles, Gregory M.; Mitchell, Douglas W. (1996). "Returns to Scale and Economies of Scale: Further Observations". Journal of Economic Education. 27 (3): 259–261. doi:10.1080/00220485.1996.10844915. JSTOR 1183297. ^ Frisch, R. (1965). Theory of Production. Dordrecht: D. Reidel. ^ Ferguson, C. E. (1969). The Neoclassical Theory of Production & Distribution. London: Cambridge University Press. ISBN 978-0-521-07453-7. ^ a b Shalev, Moshe Eitan; Asbjornsen, Stee (2010). "Electronic Reverse Auctions and the Public Sector – Factors of Success". Journal of Public Procurement. 10 (3): 428–452. SSRN 1727409. Färe, R., S. Grosskopf and C.A.K. Lovell (1986), “Scale economies and duality” Zeitschrift für Nationalökonomie 46:2, pp. 175–182. Panzar, J.C. and R.D. Willig (1977) “Economies of scale in multi-output production, Quarterly Journal of Economics 91, 481–493. Silvestre, Joaquim (1987). "Economies and Diseconomies of Scale". The New Palgrave: A Dictionary of Economics. 2. London: Macmillan. pp. 80–84. ISBN 978-0-333-37235-7. Zelenyuk V. (2014) “Scale efficiency and homotheticity: equivalence of primal and dual measures” Journal of Productivity Analysis 42:1, pp. 15–24.